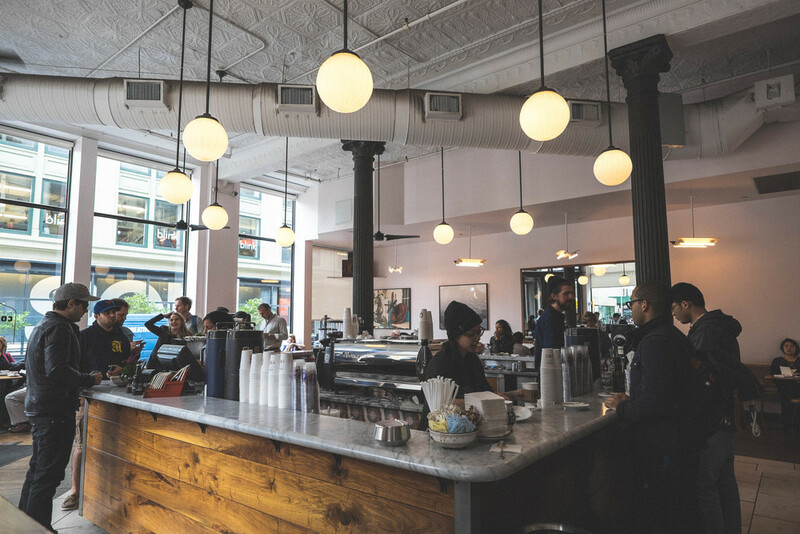 Inside La Colombe, great for freshly brewed coffee and people watching in Manhattan. Some folks go to the gym 2-3 times a week. I go to La Colombe, a coffee shop situated in Noho on Lafeyette. Their coffee is made from earth conscious ethically traded beans. But the coffee is not gets me coming back everyday. It's the mugs. And the humans. I never get take-out at this spot. Always get it in the mug (see below photo). Something about that mug just brings out the soul of the coffee. And the people. Beanies seem to be a prerequisite for working as a barista here. That and facial hair it seems. I met Malcom Galdwell here once, we talked about his upcoming book at the time. It was great. Great people watching spot if you have a few minutes to spare. And finally the interior design. Just look at that circular arrangement of ceiling lights! And the slabs of wood. And that gigantic vent tube apparatus thing running adjacent to the ceiling. It's perfect. Oh and did I mention a cup a joe here is $2.50 flat? Like I said, perfect. I die for these mugs. So much character. You better not apply for a job here if you can't pull off a beanie. A quick style check from the entrance.